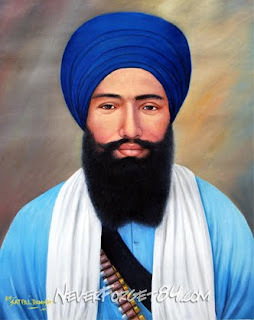 Shaheed Bhai Amarjeet Singh Khemkaran was born into the household of Sardar Kashmeer Singh & Mata Gurdeep Kaur in the year of 1953 in the village Khemkaran which nears the Pakistan border. Generally people hailing from the Majha area of Panjab are traditionally very fit, athletic and have strong muscular physique. Bhai Amarjeet Singh was no different, and due to this Bhai Sahib was accepted into the Panjab Police in 1972. In 1978 Bhai Sahib was married to Bibi Malkeet Kaur, daughter of Sardar Gurmej Singh of village Mani Singh wala. In Vaisakhi (April 13) of the the same year the Narkdharis carried out a procession on the sacred land of Amritsar in which the Sikh Gurus and faith were being insulted. A group of Sikhs marched to protest against this procession, the group was fired upon by the Narkdharis with the assistance of police officials which resulted in the martyrdom of 13 Sikhs. The procession and subsequent massacre outraged the entire Sikh Nation, Sikhs all over the world were left hurt and saddened and demanded justice against the perpetrators.